When you think of metal detectors for under $200, the word cheap may be the first thing that comes to mind. After a bit of research, consumers realize that there is nothing generic about these brand name metal detectors. They are consistently ranked high on multiple lists and continue to provide accurate object detection. Available at a low price, the TK4 Tracker IV is sold as a single unit or with starter accessories. The price changes to average if you choose the latter, but it is well worth it. Several detection modes round out the full features of this device, with the motion all metal and discrimination mode being the most notable. Two tone audio mode is helpful for users that need a clearer indication of found objects. Ground balance is set up from the start to be useful on the worst ground conditions, leading to less false positives and better precision detection. The build from top to bottom provides assurances related to durability. Since the detection rate was set up for extreme ground conditions, it became increasingly important for the company to make sure their product could hold up to the area it was used in. A traditional control interface is used with dual knobs and buttons using quick access options to change detection on the fly. The search coil is waterproof up to eight inches, and if you purchase the starter pack it will contain a bag, pinpointer, headphones and a pouch/trowel kit. 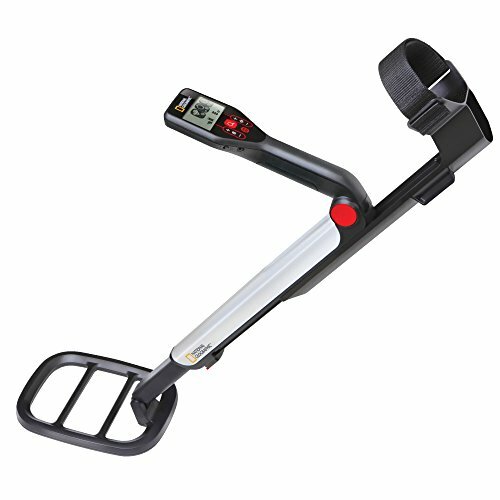 This is one of the most popular metal detectors in the industry and a good pick no matter what level you are. 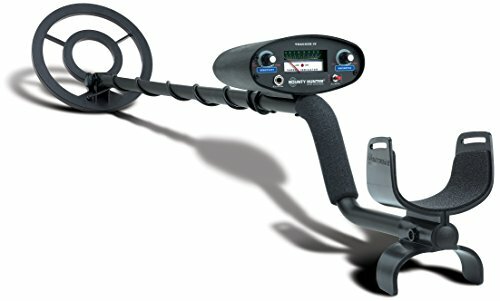 The ACE 200 is a high quality metal detector that’s available at an average price, barely making it into the $200 mark. But what you get is a lot of product for your money, starting with the massive 6.5×9 inch waterproof coil. No matter the terrain you won’t miss any important metallic objects, even when it is raining. Also in the package are a pair of Garret Treasure Sound Headphones. They are perfect for metal detector sounds and even great when paired with a music player. Four branded AA batteries are included in the package to get you started, but that is just the beginning. As an outdoor product, anything can go wrong even when a metal detector is used correctly. Garret bundled a two year warranty on all ACE 200 models, which is more than enough time for light and heavy users. Stem stability is kept in check with the new camlock system, improved greatly from previous iterations on other models. All of this is packed into a lightweight frame, which is incredible when you consider that most of that comes from the coil. With the huge performance of the ACE 200, you’ll never look at another metal detector the same way. Starter kits continue to gain popularity with metal detectors, and that is where this low cost INTEY model shines. Buyers can switch between the all-metal mode or discrimination mode based on the type of objects they’re after. You can filter out a lot of the most common metals with the disc mode so that the device concentrates on important materials only. With its high sensitivity setting being used with the included pinpointer, you’ll have a better chance of getting the results you want. INTEY made this model to be superior as an all-terrain metal detector with few flaws when changing from one area to the next. Disc settings can be handled based on iron, pull ring/5 cent, zinc/1 cent and coppers. The coil is waterproof with an adjustable stem to keep the rest of the device safe. This lets you get into shallow water without any damage to the product. A carrying bag and multi-function shovel comes with the entire package. The shovel folds to save space and weighs less than the metal detector. When traveling with the bag, buyers can take the entire product apart so that it fits. Batteries aren’t included, although a single 9 volt will get it going. An easy to read traditional control panel turns this INTEY model into one of the better choices for a $200 and under metal detector. You can take it anywhere, and the extra accessories really improve it as a starter it. The Quick Silver is a good example of putting everything essential into one product. It’s low cost, and comes with a spectacular five year limited warranty. That’s one of the longest warranties you can get with a metal detector, even when you spend 10x as much for another brand. Modern touches help out the main interface, using push button controls rather than knobs or buttons. It uses a touch sensitive interface to control discrimination, with an LCD to show current modes. Ground balance is always on auto, alleviating the user from having to deal with advanced terrain options. The frequency is good at 6.6 kHz, with a lot of the identification of metals posing no troubles for this particular model. Instead of the usual two tone system, the Quick Silver ups it to three tones to give the user a much better audio notification. All of these bells and whistles take up a bit of power, so two 9 volt batteries are necessary to operate it. Buyers should stick to branded 9 volts so that they can get months of use from a single charge. Bounty Hunter also added their popular pinpointer to the package, with adjustable sensitivity control, battery strength indicator and a one year limited warranty. Great comfort options and a solid warranty are plenty of the reasons to consider buying the Quick Silver. Count this as another low cost metal detector from INTEY that has great all terrain functionality. You can now go after multiple different types of metals like gold nuggets, hunting coins and more. It is even built well for shallow water hunting due to the waterproof search coil. Discrimination settings are plentiful, and it handles iron, zinc, cap and pull ring. When using the high sensitivity setting there are a lot of areas that benefit from the extra power. And if your battery is running, low, the visual indicator gives accurate readings so that you can time a battery change accordingly. A multi-function folding shovel was added to the set to help unearth found objects. Although the shovel is light, it is still successful at penetrating tough surfaces. Like most INTEY products the metal detector can be broken down into small pieces for transport. Comfort options are present for the arm to keep users from feeling strained after long periods of use. Adjustable arm length is useful for both children and adults, so this metal detector can be used by anyone in your family. With the beginner friendly control panel, this is the best INTEY model to buy for multi-person use. At this point users should be familiar with seeing INTEY on a metal detector list. This is another one of their low cost products that delivers great results. The difference in this INTEY model is the general look and the target audience they are marketing it towards. Instead of an LCD screen, they opted for a traditional control panel with a pointer and dial. Controls are simple but still based on advanced discrimination methods. So even with the two knobs, there are still a lot of different filters under the hood when you’re not operating in full power mode. The usual INTEY extras are included in the package; carrying bag, multi-function folding shovel and of course a waterproof coil. A single 9 volt will get everything going, although two is recommended for extended use. When the juice runs low, there is a red spotlight that works as an indicator to alert the user. Weight of the unit is average, coming in under four pounds if you count the shovel Getting used to the pinpointer is essential to making the most out of this package. 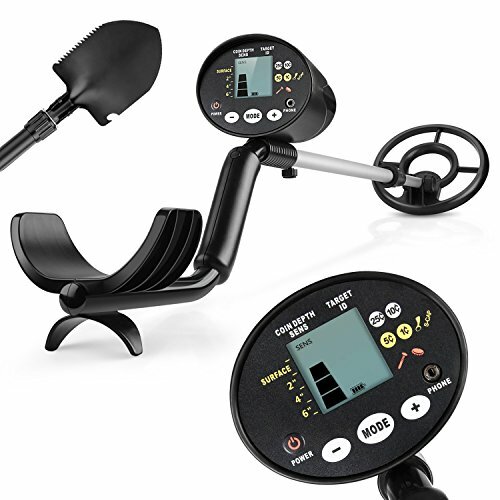 Buyers that hate modern LCD’s will be right at home with the purchase of this metal detector. Metal detectors that are suitable for adults can be problematic when a kid needs to handle it. That is why this INTEY model was built with juniors in mind, with the size and function being truncated for juniors. The size is adjustable, so when it’s fully extended adults will have no trouble using it. When looking at the control panel users will get a much more simplified range of information. The meter goes from zero to ten, and on the bottom are three knobs for volume, sensitivity and discrimination. A low battery indicator rounds out what is considered to be the best control panel for beginners using a metal detector. Intelligent filtering options can eliminate every type of metal during a search except for gold and silver. The big carrying bag is great for packing everything into one space, including the multi-function shovel and LED flashlight. And a little more beef was added to the user guide to make it friendly to first time users. A single 9 volt battery is needed to power everything. Because of the low power draw, it can be generic or branded without too big of a difference in run time. The color they went with is great for boys or girls (blue) so there is a nice aesthetic quality to the finished product. 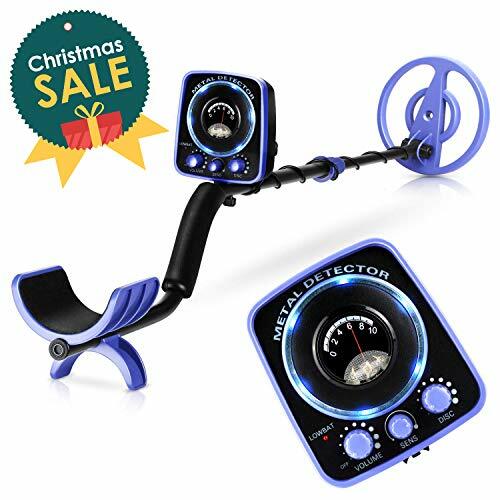 With its low price, this is the best metal detector on the market for juniors. Last on the list is from the National Geographic PRO series. 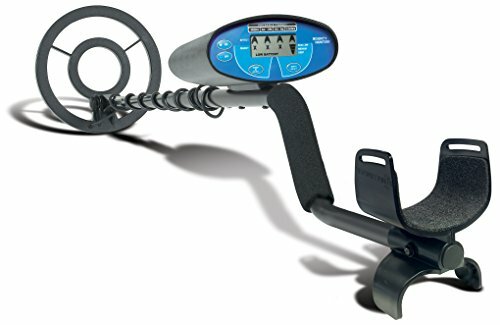 As a familiar brand name, National Geographic introduced this average cost metal detector as an answer to the rest of the industry. Even though this is full sized adult product, it’s adjustable and therefore usable by children. The design proves that, with National Geographic using a much different look than other companies. Fully extended it measures 45x11x7 compared to 22x4x7 when collapsed. The 10 inch coil is waterproof and protected under a two year warranty guarantee. Precision is fantastic, even without the use of the pinpointer. Accuracy is the main strength of this set, starting with how the LCD screen displays valuable information. You can track important metals even if they are ten inches underground. Using any of the four sensitivity modes will net you positive results in the search for precious metals. Built in filter controls are handled by the three detection levels, with a low learning curve for users that are new to metal detectors. Everything is ready to go right out of the box with no assembly required. If the INTEY junior metal detector is too simplistic for your kids, then the Pro series from National Geographic will be a big step up since it’s made for adults but can be used by children. Buyers can’t go wrong with this National Geographic branded metal detector. They come with a guarantee that only a few other companies can match. National Geographic and INTEY are the two best brands on the list. They have proven time and time again that their focus is on creating customer friendly metal detectors for all ages. National Geographic is the most recognizable name, so their success comes as no surprise to followers of the brand. It’s till interesting to see them create a product that rivals more established names like INTEY. As far as having the fullest catalog available under $200, INTEY wins by offering a range of different metal detectors for a low price. They keep the features consistent with the price so that you have more models to choose. Waterproof – Although not fully submersible, the coil on most of the models can work underwater. Buyers should pay attention to the wording so that they spot the difference between waterproof ‘submersible’ and waterproof ‘rainproof’. That makes a big difference on whether it is useful in a beach or lake setting. Up To Four Sensitivity Settings – Devices like the National Geographic metal detector are equipped with up to four sensitivity settings. Being able to control the lows and highs of this feature will help save battery so that you only crank up the power when needed. Different Control Panels – Whether you’re into an LCD display or the traditional meter setup, there is always a choice available. The variety with this feature is important for professional users that have refined preferences for their metal detectors. INTEY and National Geographic are the only two brands on this list to have metal detectors suitable for child use. INTEY in particular made a junior variant of their most popular model, and it works wonders for getting children into the hobby of object hunting. There are some key differences in the way the junior model is made, starting with the available information on the control panel. INTEY did their best to give users the full metal detecting experience without restraining them too much. It is a good balance without overwhelming children that are completely new to hunting for objects. The National Geographic model is the only metal detector on the list that innovates with its look. The coil is shaped different, and it is such a noticeable difference that consumers will think there is a physical advantage. 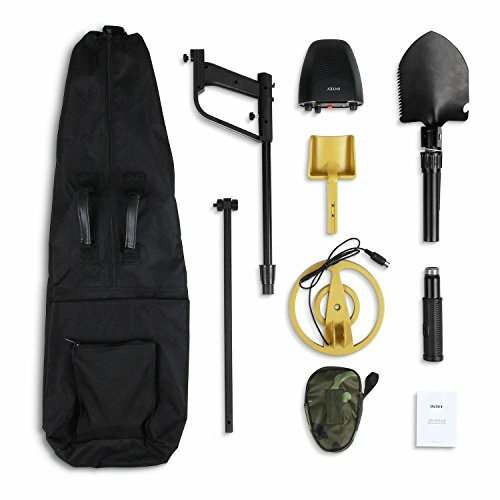 There is no physical advantage associated with the shape of a metal detector’s coil, so other than aesthetics the Pro series from National Geographic has the exact same components. Higher sensitivity levels will do away with any advantages a small coil would have by squeezing into tight spaces. Outside of special circumstances, the design used for $200 models are the same as top tier models. Warranties are standard limited versions that cover important parts like the coil. Every now and then you’ll get a gold standard warranty for a $200 and under metal detector. Outside of the average warranty, National Geographic provided the best coverage for the products. Their two year manufacturer guarantee was the best available, and even rival’s products in other tiers. The only thing required to activate your warranty is the original purchase information. It leads to a painless process of getting your metal detector fixed without spending hours sending emails back and forth. Other brands on the list weren’t too far behind, so users will be well taken care of no matter who they choose. Consumers can get a quality metal detector for a low price, and in some cases well under $200. They are solid choices for all levels, and make great backups for professionals. So if you’re on the fence about making it a permanent hobby, then start out by choosing a metal detector for under $200.